An "ask the attorney" format will be used in which the issues which are of most concern to the audience will be addressed. A brief overview of the relevant law will be presented followed by a question and answer period in which questions and answers will hopefully be exchanged between the presenter and the audience ("the Socratic Method"). How to readily create copyright property of substantial value. How to readily create patent property of substantial value. How to leverage the intellectual property rights created to maximum value with clients and prospective clients (in particular, what to say, or not to say, in the initial negotiations). 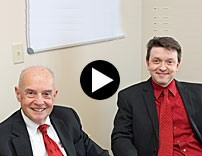 Here is a brief video in which Howard and Peter describe their presentation. Howard J. Greenwald is a Patent Attorney who has been practicing law since 1966 (eventually he'll get it right) and has been practicing law in Rochester, New York as Howard Jay Greenwald, P.C since 1983. He has obtained more than 400 United States patents for clients, and he has been involved in every aspect of patent preparation, patent prosecution, patent litigation, and patent licensing. He currently is of counsel to the law firm of Schmeiser, Olsen & Watts, LLP, having come out of retirement in order to again do something worthwhile with his time. Peter Mikesell is a registered patent agent at Schmeiser, Olsen & Watts LLP. Peter graduated from Illinois State University in 1995, earning a Bachelor of Science in chemistry. He spent several years working in industrial research facilities developing custom polymers before being licensed to practice patent law before the U.S. Patent and Trademark Office (USPTO). He received a Ph.D. in organic chemistry from the University of California, Santa Barbara, where he researched synthetic electrochemistry and natural product synthesis with a particular emphasis on biologically active natural products.